The Braves played terribly against the Nationals. The pitching staff was a giant ball of refuse soaked in moonshine and set ablaze as it rolled unchecked down Hank Aaron Drive. Nothing about the pitching in this series was positive. However, the Braves offense was very positive, and even though the defense gave up 30 runs, they still managed to win a game. Small miracles and Amy Grant songs. Game 1 was the game we won. The Braves really turned on the offensive jets as they scored eight runs in the match. Kelly Johnson had a huge day as he went 3/4 with 3 RBIs, and a homer. Even Peterson who has been struggled at the plate when 2/2 with a walk. 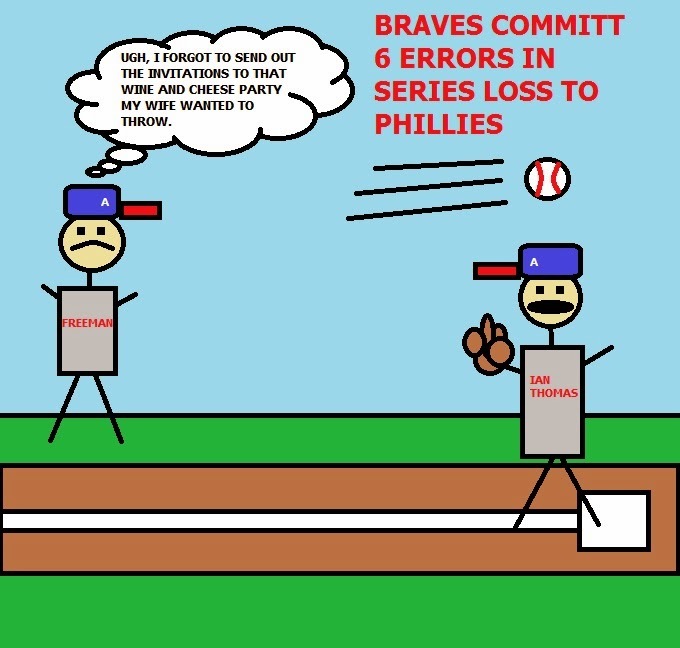 It was all going right for the Braves, except the pitching. That should have been a warning sign. Stults was fine, he went 6.1 innings with 2 runs, which is a quality start. But then the bullpen came in and gave up 2 runs 3 innings. Bad omens. Game 2 was the one we'll all remember for a long time. Allow me to set the stage. The Braves are facing a young buck fresh out of AAA named AJ Cole. They proceed to demolish poor Mr. Cole to the tune of 9 runs in 2 innings. In essence, they gave him a welcome to the big leagues moment. I kept reminding people on Twitter, feel bad for a guy after you win and the game is over, until then there's no such thing as too many runs. Holy crap was that ever true, because our pitching staff lead by Julio Teheran kept putting on the leadoff man. The Nats whittled down the lead from 8, to 7, to 4, to just 3 runs before finally Fredi yanked Julio. Then Avilan came in and gave up 3 more runs. The Braves scored one of their own, so what was a 9 run lead was down to just 1. 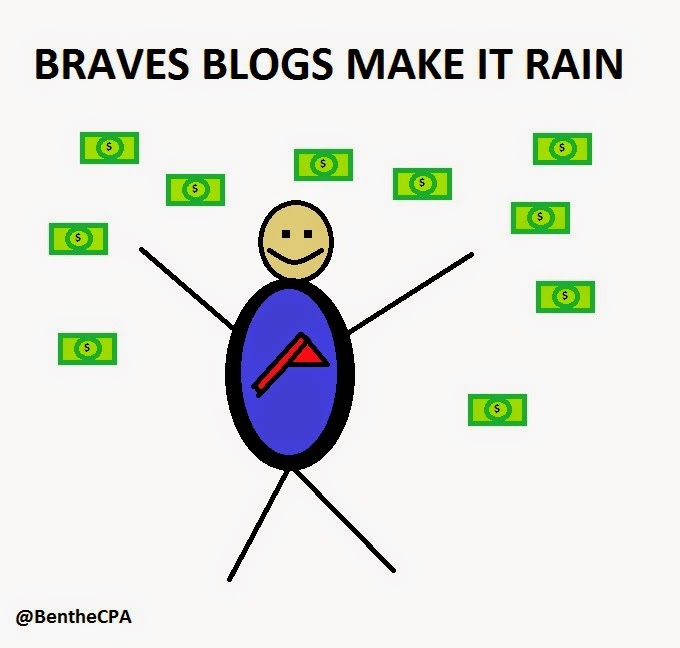 But the Braves scored again and made it 12-10 going to the 9th. That's when Dan Uggla came to the plate with two runners on and one out. Instead of rolling out the traditional Dan Uggla double play, he crushed a Grilli fastball into next week, and the Nats won the game 13-12 in a stunner. We got Uggla'd. Trademark that. Game 3 I barely watched because the Hawks were fighting for their life in the playoffs. But the pitching was just as bad, and the Braves gave up another 13 runs. Lost in the shuffle here was the fact that AJ Pierzynski is hitting like a madman, going 6/11 with 8 RBIs in the series. Oh and Freddie Freeman is back to crushing the ball going 8/13 with 4 runs scored. That kind of crazy hitting should win you games, but alas, the pitching was the clownshoes effort we saw in all three games. Alex Wood gives up 5 runs in 5 innings, then for some reason we bring in Cahill from the bullpen because he's too terrible to be a starter, and he gives up 4 runs in 2 innings. You know what Cahill should be doing? Sipping fruity drinks with hats on an island somewhere in retirement. Because he can't pitch anymore in this country. Throw Dan Uggla a fastball - He can't hit a curve, we've seen it for years. Why you throw him a dead red fastball down the pipe with an 0-2 count and the game on the line? I'll never know. Possibly the most Atlanta Barves moment of the decade. The pitching in general - You shouldn't give up 30 runs in a week, let alone in a series. The fact we wasted our big offensive output - The Braves scored 20 runs in this series. That's huge for us. That's really huge. And yet we lost two of the three games because the pitching made me want to vomit. The NBI goes to the bullpen. All of it. Get it together you goofballs. We have the 28th reliever ERA in baseball now. That won't fly with the kind of team we have on the field. 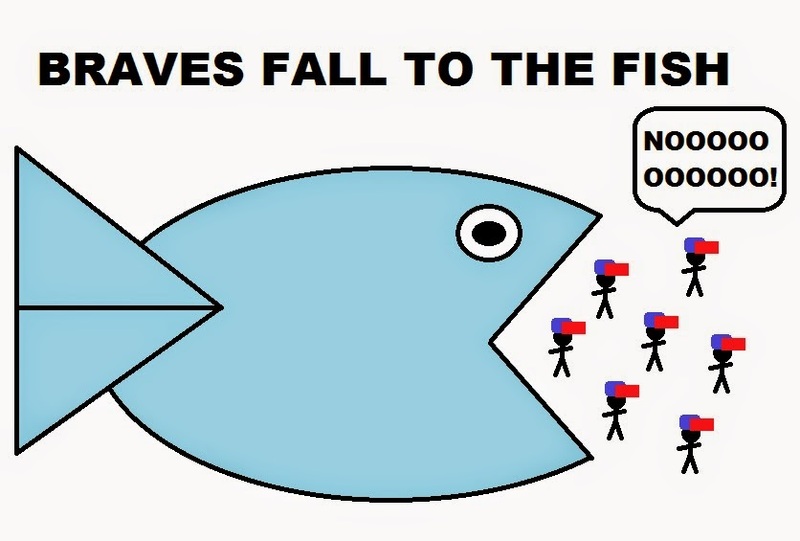 We're not supposed to be bailing you out with offense. Next up, we face the Reds. How are they doing? Standings say they are also 1 game under .500 with the same record we have. Should be interesting. 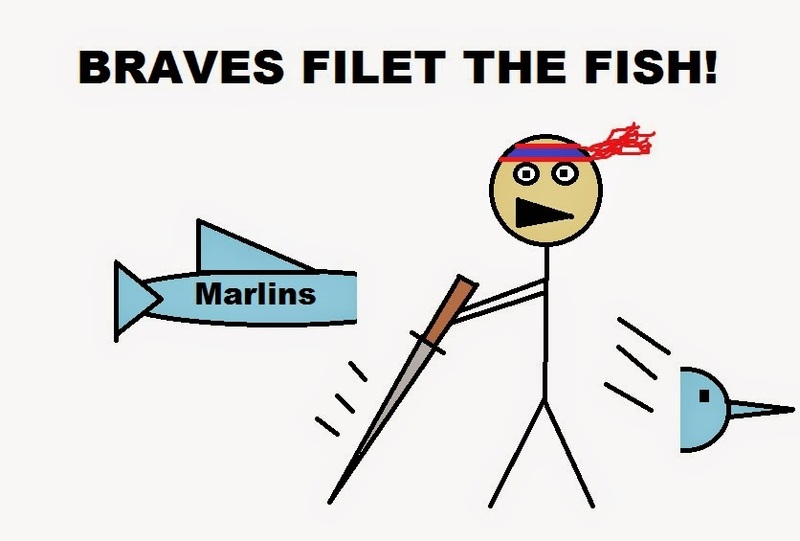 Time for a quick preview of the Marlins and the Braves, this time inside Turner Field! Shelby Miller got a no-decision in his first game against the Fish, although the Braves did end up winning in a 2-0 effort. Still, 5 innings of shutout ball was nothing to sneeze at, and I hope Shelby can keep the train rolling against a slumping Marlins lineup. Meanwhile, the Braves absolutely destroyed Mat Latos the first time around, not even allowing him out of the first inning. I'm sure Mat is looking to get some revenge, and the Braves are probably looking for pitches out over the plate. Trevor Cahill is the Braves starter you haven't seen yet. Over the last three years he's faced the Marlins four times, and he's never recorded a loss to go with 2 wins and a 3.00 ERA. However, the current Marlins lineup hits Cahill really well lifetime, especially Ichiro who is 12/30 off of him. I'd expect to see Ichiro get some playing time in this game given the splits. Koehler is the guy the Braves dinged for two runs in the loss when Shelby Miller was pitching. Koehler didn't pitch badly, he just made one bad pitch to AJ for a homer. The Braves will have to try to get more production against him in order to pull this one out. The final game features Eric Stults after he looked very average in his opening start. Although the Braves ended up winning, Stults was getting lit up in the zone with several hard hit balls, including two that left the building. He opposes Dan Haren whom the Braves didn't see yet. Haren held Tampa Bay to just one run in 6 innings with his first start, before the Miami bullpen imploded and gave up 8 runs of their own costing him the decision. Haren has owned Atlanta in his last 3 years with a 1.71 ERA in 3 starts, and he's held the lineup to a sub-.600 OPS. This will be a race to the bullpen if the Braves hope to win the game. 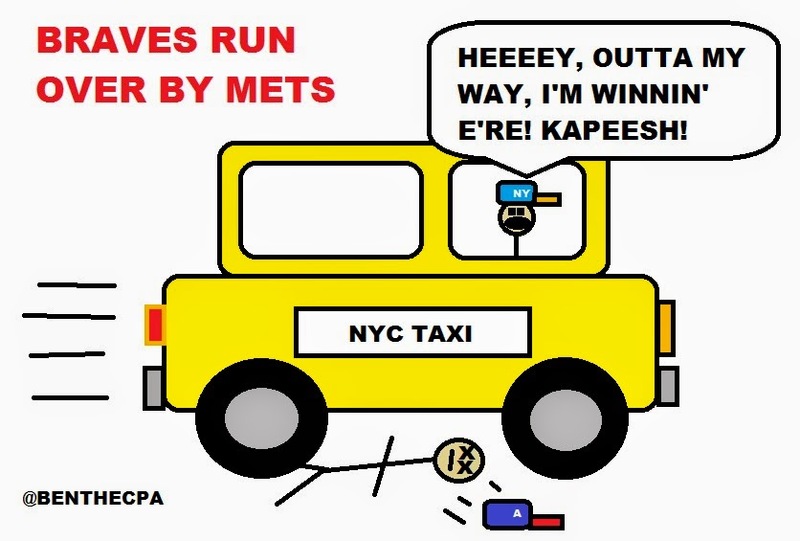 The CPA went 1-2 in the first 3 games it picked for the Mets, so let's hope for some better picks in this series! Ugh. 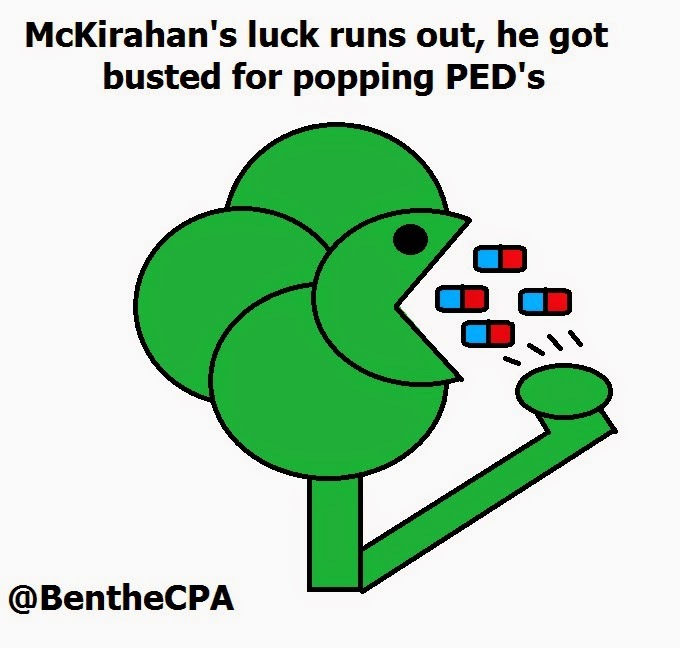 The CPA doesn't like this series. That's why it's a soulless machine, and not a fan. Hopefully those numbers are just the results of some early bugs, and the Braves can take the series. So we're not perfect? So what? I'm not perfect either anymore. I was for a brief time around 1999, but I blew it when I predicted that Y2K would cause the world to end. And yet here we are, world still spinning, my phone still works, and AI is slowly learning how to drive cars by themselves before they all turn on us like all the Terminator movies warned. WE DIDN'T LISTEN! 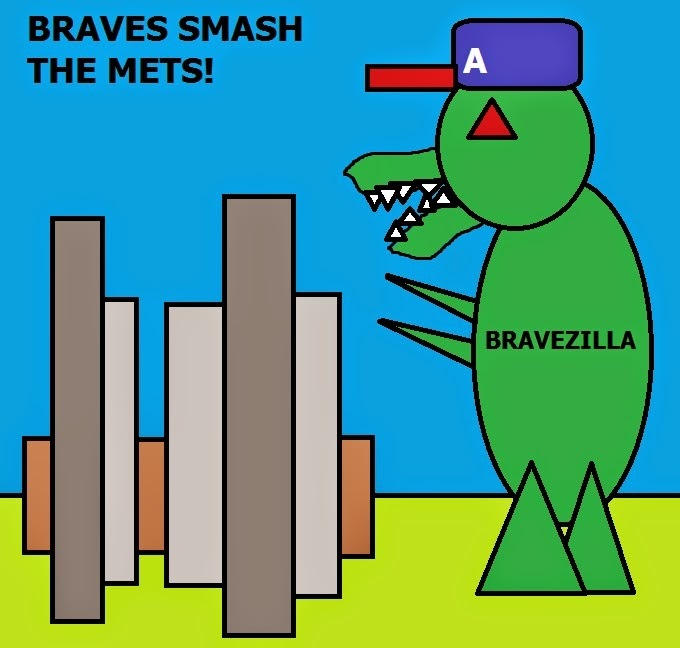 In game one, the Braves jumped on the Mets earlier with a lead-off Maybin homer, a Jonny Gomes RBI, and an error by the Mets SS that plated a run. That made it 3-0 Braves for the earlier part of the game. However, in the 4th inning ole David Wright did his best Anti-Chipper routine and jacked a two run homer, followed by a back-to-back shot by Mayberry. With the game tied, it came down to a battle of bullpens late, and the Braves emerged victorious when Goose Gosselin smacked a 2-run single with two-outs. Braves won 5-3. Game two saw Julio Teheran dominate for six innings of shutout ball while the Braves amassed a 5-0 lead. Then in the 7th it went to pieces as Julio stayed too long in the game and gave up 3 runs. But the bullpen again put out the fire on the way to another 5-3 victory. Freddie, C-Beth, EYJr, Marky-Mark, and Simba all had RBIs in the game. Game three was the one that got away. Braves got down early on a 2-run shot by Cuddyer, then the Braves tied it on Simmons 2-run triple. But unfortunately, the Braves gave up the lead again when the Round Mound of Downtown Bartolo Colon got his first RBI in 10 years. Yes, the pitcher. Yes, 10 years. If I didn't find the man so hilarious I'd hate him. Jonny Gomes tied the game again at 3-3 with a solo jack. Still, Fredi is gonna be Fredi, and Fredi makes stupid bullpen decisions. The manager brought in Juan "Who wants to walk the ballpark" Jamie to relieve in the 8th, and he gave up 3 walks and a run. Game over. Mets win 4-3. Despite Jaime not finding the strike zone, I really liked the bullpen this series. They gave up just the one run, and they've been very effective in dancing out of trouble for the most part. Simmons went 4/10 with 2 runs and 3 RBIs on the series. That's outstanding hitting for a guy that's known primarily for his glove. Jonny Gomes had a homer, 3 runs, and 2 RBIs in just two games. He also had the play of the game in my mind for game 3, when he beat out a sure double play, and that opened the door for Simmon's 2-run triple in a two-out rally. The MVP of the series has to be Simmons. For a guy to really shine like he did going 4/10 with 3 doubles and a triple in 3 games? That's insane. Plus he threw out a runner again from literally left field. He can do it all, and we'll need him to do it all this year. 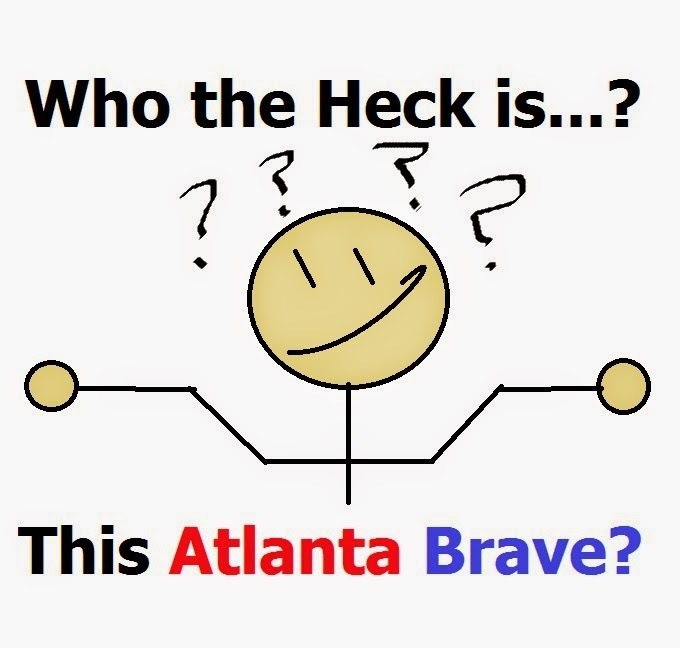 The Braves won a game! We're leading the NL East! USA! USA! USA! One of the reasons I like Twitter is that it's totally ridiculous and overtly reactionary. Your opinions can look very stupid literally 30 seconds after you post them during a baseball game. 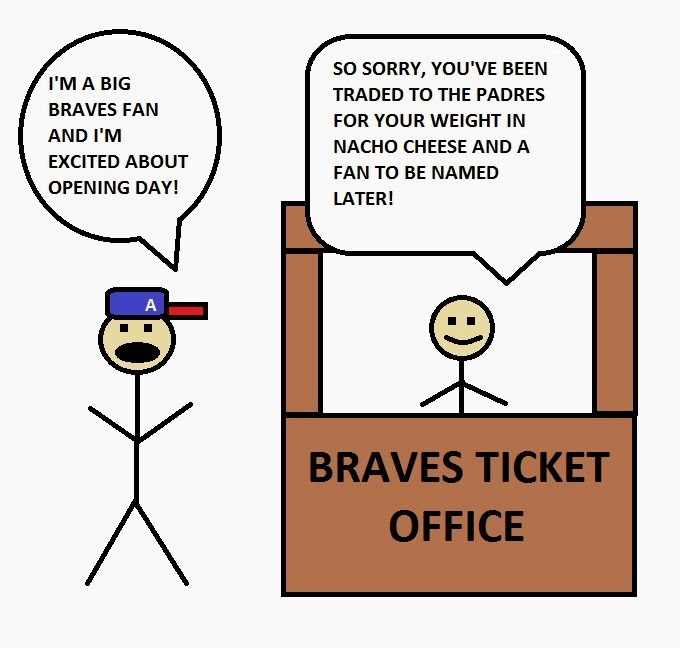 WHY DID FREDI GO TO AVILAN, MORON! One minute later that becomes: YEAH 5-2-3 DOUBLE PLAY OMG BRAVES ARE BACK! It's like watching a bunch of twelve year olds high on meth driving bumper cars, in 140 characters or less. Which is why I enjoy it but rarely get wrapped up in it. Because really when you get down to it, Twitter is supposed to be about silly fun, not predicting the future, or declaring your massive intelligence. Still, I had some fun with it over the last 24 hours. The Braves played the first game well, not great. They scored some runs, moved some runners, got some hits and looked very fast on the paths. I'll do a full recap after the series is over. 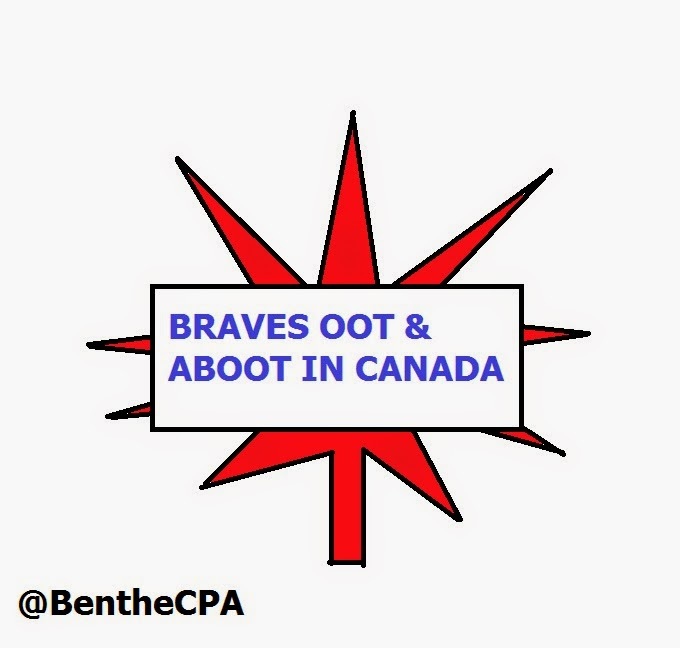 That's all for the best because the Braves are going to need to play proverbial small ball to compete. Combined with solid pitching, that's probably going to be the most key thing about this team's success. 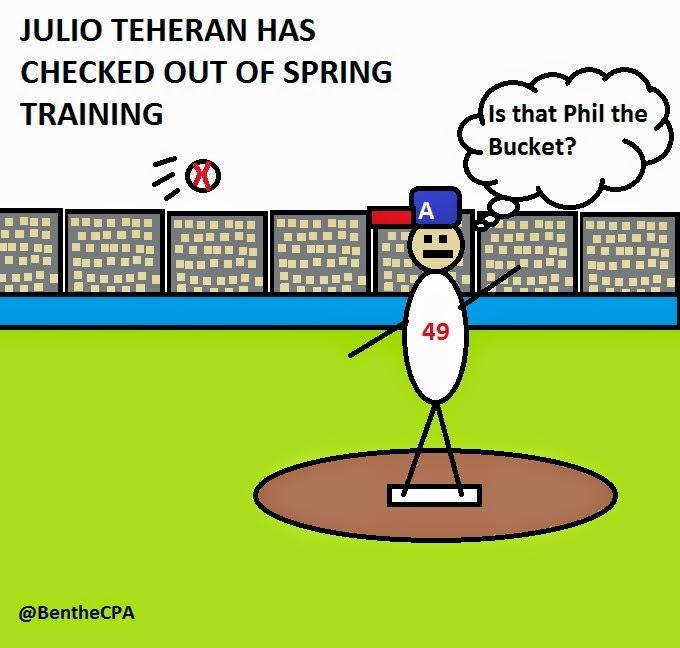 Julio Teheran looked pretty good coming off a spring where he looked pretty bad. Shocking how little that matters, as I covered in my Julio post earlier in the month. Next, we get to see how Alex Wood looks, and frankly I expect him to look pretty good. He had a blistering start last season in the month of April, but the Braves couldn't put two runs on the board. Seriously, he lost two games where he went 8 innings each giving up one run. But also reflect that the Braves were one pop fly from possibly losing that game. They had to have Avilan put out a bases loaded fire with no outs. They had to have Johnson shut the door. 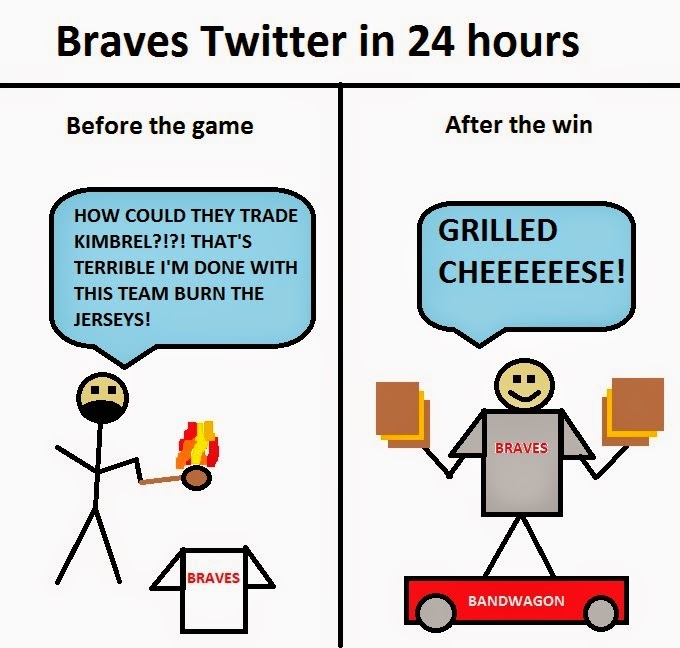 They had to have Grilli get the one-run save. The bullpen that I have questions about looked really solid in their first game, but that's only one test. There will be likely 150+ of those, and if you get into bases-loaded-no-out jams enough, the odds tell you that you will lose those battles. So just remember, I don't make any value judgments about players on the team until we've played 40 games. 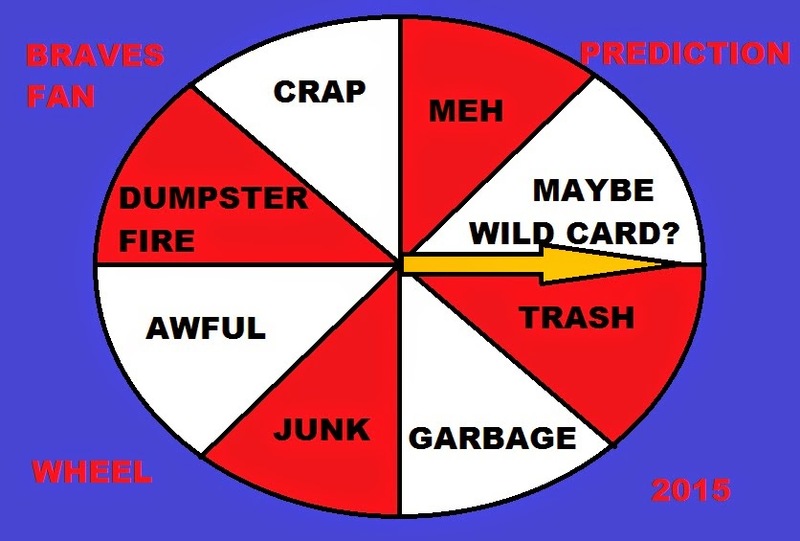 Similarly, I don't make many value judgments on the team until Memorial Day, other than my early predictions. It's fun to ride the roller-coaster occasionally, but it's less fun to ride it every day, with every game. You'll go nuts. Don't go nuts. Leave that to the professionals like me.